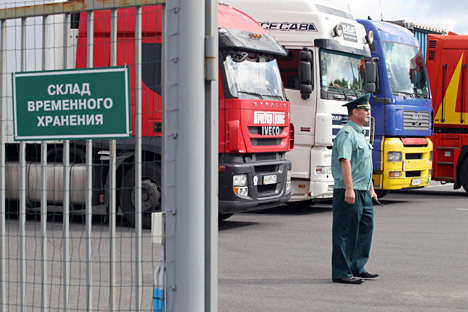 In the long struggle between the Federal Antimonopoly Service (FAS) and the Federal Customs Service (FCS), the latter is calling the shots and pushing the last independent importers on the Russian market toward the exit. A set of Civil Code amendments, currently under review by the State Duma, will only reinforce the dominance of the FCS. In response to the question of why everything is more expensive in Russia than in the West, the fashionable answer is: because of corruption. Importers, however, know better. Corruption exists, yes. But the real reason dates back to 2002 and the banning of parallel imports in Russia. Since then, the screws have only tightened even more. “If parallel imports were allowed, imported goods in Russia would be 25 percent cheaper,” said Anatoly Semenov, a public advisor to the Federal Antimonopoly Service (FAS). Many companies agree: in recent years they have been deprived of imported goods and forced to work directly with official distributors. “Even if you buy goods from a seller at an ordinary Polish subway station (never mind the manufacturer), and pay all duties in full, they can still be sold in Russia for 20-30 percent less,” said lawyer Maxim Sosov. He knows about this firsthand: Sosov defended Elitvoda Ru in court, after the company employed this very method to import Guinness and Krusovice beer and Evian and Perrier water into Russia. Sosov ultimately lost the case to the plaintiffs and owners of those brands, Heineken and Nestle. This is also the stance adopted by the FAS. Igor Artemyev, head of the agency, says that he intends to seek a repeal of the ban by mid-2013; although, he previously had his sights set on mid-2012. Given that his opponent is the omnipotent Federal Customs Service (FCS), the chances of victory are slim. Still, the FAS asserts that the prohibition of parallel imports violates not only market principles but most international practices also. The principle adopted in the United States, Japan, and the European Union maintains that the trademark owner automatically forfeits control over a good under its own brand after it sells the good; this means that the good is then free to be re-sold by anyone, anywhere. Russia, meanwhile, has followed the “territorial principle” since 2002: the owner of a brand controls all sales of its product, and has the right to ban importation. Therefore, customs officers view original goods imported without the trademark owner’s knowledge to be counterfeit. Even now, prior to the final adoption of the amendments to the Civil Code, the parallel import business is quite risky. Daredevils face confiscation, in addition to a hefty fine. One circumstance seems to justify the risk, however: many producers do not consider it necessary to take action in relation to parallel imports. Individual entrepreneur Yevgeny Pantyukhov lives in Sakhalin and takes frequent trips to Japan. There, he fell in love with Maxim (the brand of coffee) and, on his return to Russia, discovered that the alternative sold in Russia was less tasty. He went to Japan again, bought a consignment of coffee, and filed a customs declaration. His honesty was thus rewarded: in the absence of official permission from the rights holder to import the goods, the customs office imposed interim measures of protection. Simultaneously, Kraft Foods Inc. – the official producer of Maxim coffee in Russia – filed suit against Pantyukhov for unlawful use of its trademark. The court upheld the claim in full, not only banning the sale of that specific consignment of goods, but also prohibiting the importation of all products under the Maxim band (around 30 designations). Pantyukhov had time to re-export the goods back to Japan; but residents of Sakhalin were deprived of delicious Maxim coffee, which, in their opinion, beats the Russian version hands down. The same problem can be found in the market for automotive components. Mikhail Kulyabin, director of Avtologistika Ltd., says that it will soon be impossible to buy spare parts for imported cars on the market more cheaply than from authorized dealers. Prices at authorized dealerships are often several times higher, but independent importers are closing in quick succession, as they continue to lose lawsuits against car manufacturers. Avtologistika itself has lost several cases to BMW Group. “Can unofficial importers of medical equipment really be trusted?” asked executive director of Rusbrand, Alexei Popovichev. “After all, it’s not clear where and how it was brought in, whether or not the goods are past due; and there’s no quality of guarantee or after-sale service. And they want to supply aircraft parts?” In his opinion, lifting the ban on parallel imports would only mean one thing: more counterfeit goods. Another opponent of parallel imports is Anna Dycheva, a member of the board of the Russian Perfumery and Cosmetics Association. “Official distributors invest heavily in marketing, train consultants, and promote the brand, but others get the sales revenue? That’s not fair. There are plenty of fresh brands out there – find a niche, develop a brand, and start earning,” said Dycheva, giving advice to would-be entrepreneurs. Her view that unofficial importers should seek out new, little-known brands is widely shared by established manufacturers of luxury clothing, shoes, and accessories.